The Anason family has its roots in Rogaland County in western Norway. The earliest known member of the Anason family came from a region of Rogaland that has since become part of Vest-Agder County, Norway. 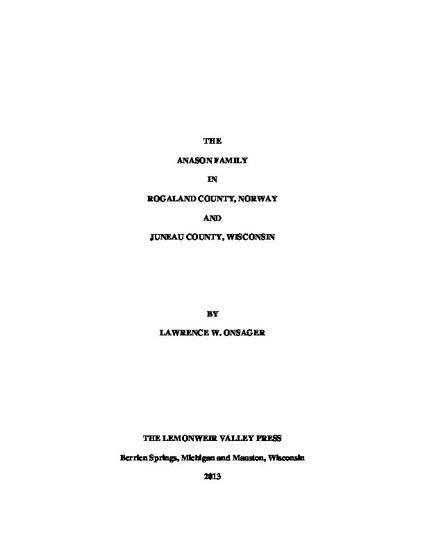 Thormod Lovass Anason emigrated to the U.S. in 1869 and settled in Juneau County, Wisconsin. He married Herborg Olsdatter in 1876 which connected him to the Suldal Norwegian American settlement in Juneau County. This book is copyrighted and should not be reproduced without permission. Portions may be copied for personal use with proper citation.